"Not only is it an academic inquiry into academic enculturation, but also the author, Paul Prior, devotes a good deal of his energies to explaining his methodology….While Prior offers eight qualitative case studies of graduate students, his more significant contribution is an articulation of how writing researchers might think beyond the now familiar notion of the 'discourse community.'" Contents: C. Bazerman, Editor's Introduction. Preface. Part I: Introduction. Resituating the Discourse Community: A Sociohistoric Perspective. Part II: Situated Explorations of Academic Writing Tasks. Multiple Exposures: Tracing a Microhistory of Academic Writing Tasks. Making Semiotic Genres: Topics, Contextualizations, and Literate Activity in Two Seminars. Trajectories of Participation: Two Paths to the MA. Part III: Literate Activity and Mediated Authorship. Literate Activity, Scenes of Writing, and Mediated Authorship. Images of Authorship in a Sociology Research Team. Voices in the Networks: Distributed Agency in Streams of Activity. A Microhistory of Mediated Authorship and Disciplinary Enculturation: Tracing Authoritative and Internally Persuasive Discourses. Part IV: Redrawing the Maps of Writing and Disciplinarity. Laminations of Activity: Chronotopes and Lilah. 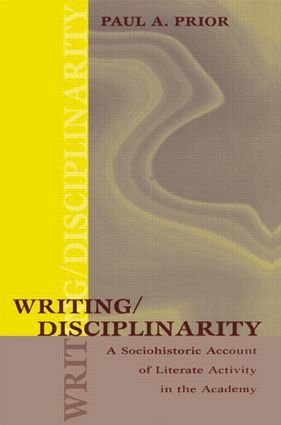 Writing/Disciplinarity: A Sociohistoric Approach. Appendices: Situating the Research: Multiple Exposures of a Methodology. Conventions of Data Representation.